President Rodrigo Duterte is accused of sanctioning extrajudicial murders. A leaked transcript of President Donald Trump's phone call with Philippine President Rodrigo Duterte last month revealed Trump's admiration for Duterte's vicious tactics in the war on drugs. "You are doing an amazing job," Trump told Duterte, who has openly encouraged his citizens to kill suspected drug users. "Operation Double Barrell," launched after Duterte took office 2016, has led to the deaths of more than 7,000 people accused of drug use, killed by police and unidentified gunmen. 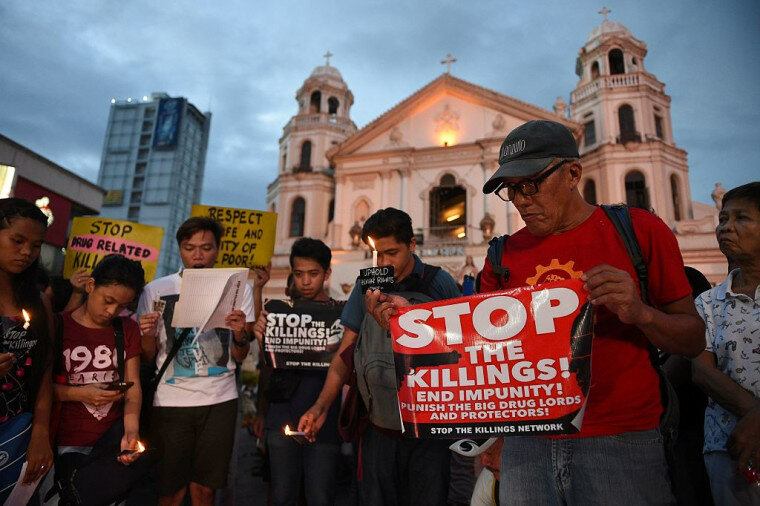 Human Rights Watch has called Operation Double Barrel "a campaign of extrajudicial execution in impoverished areas of Manila and other urban areas." "Hitler massacred three million Jews. Now, there are three million drug addicts. I’d be happy to slaughter them. If Germany had Hitler, the Philippines would have (me)," Duterte said in September 2016. "You are a good man," Trump said. "Keep up the good work." Trump also revealed the presence of two nuclear submarines off the coast of North Korea. “We have a lot of firepower over there,” Trump said in attempt to reassure Duterte on the subject of North Korea's nuclear program. “We have two submarines — the best in the world. We have two nuclear submarines, not that we want to use them at all.” This revelation comes just over a week after news broke that Trump had revealed secret intelligence to Russian officials during a meeting in the Oval Office.